Here's a sermon to check out. Limited Parking is available in the St. Luke's parking lot. Street parking is free in the neighborhood. Join us as we worship authentically, ask hard questions, hear an inspiring message from the Scriptures, and connect with others who are on a journey to inspire love in our city. You belong here. To learn more about our Sunday teachings, click here. At Pangea, we think church should be both fun and sacred. Both energetic and contemplative. Both innovative and ancient. Both relevant and deep. Through creative preaching, lively music, artful expression, and contemplative liturgy, we create a space for regular people to engage with God. No matter where you are in your spiritual journey, you belong here. Our style is quite modern (guitar-driven music, etc.) but we also lean into ancient practices (weekly Communion and liturgy) which foster a sense of mystery. Some would call us an "ancient-future" church expression. On any given Sunday we will incorporate modern worship songs, ancient prayers, holy sacraments, engaging video, and transformational sermons. If you worship with us, you might compare our "style" to the following fusion: Mennonite theology (yeah, we're kind of peaceniks), Anglican liturgy (we take the eucharist every week), contemporary music (and not cheesy either), and engaging preaching (relevant and hopeful). We have Kids programing from zero - Pre-K. Older kids are invited to join their parents in church services during this season. COME EARLY FOR some good COFFEE! ***Unfortunately our facility does not have wheelchair access. If this is a need for your family, we highly encourage you to consider attending St. Luke's Episcopal Church, which meets in an accessible building on the same campus. For information and service times, go to their website. The midweek expression of Pangea focused on spiritual transformation, family-like inclusion, & peacemaking. Villages seek to cultivate a sense of family, made up of singles, couples, and kids. All are welcome as we together discover what it means to be peacemakers in Seattle and beyond. This isn't a bible study, but it is a space where you will be known by others and will experience God's love. A Village is a group of people (about 8-18) committed to living out a shared set of values as a spiritual family. They both learn what it means to care for each other and to encourage each other in a lifestyle of peacemaking. It takes a village to raise a child, as the old saying goes, and it truly takes a village to experience life transformation. It is impossible to become fully alive as a human being—by becoming more like Jesus—without the company of others. Jesus had about 12, plus several others—we need the same. If you attend Pangea on Sundays, checking out a Village is your best next step. Everything we say and do is our attempt to lean into our vision and values. We derive these from the Scriptures and the ancient practices of the church. Reading through our values will give you the clearest picture of the kind of church Pangea strives to become. God intends the world to be a place where all relationships are made right. Jesus, through his life, death, resurrection and ascension, empowers all people to live as signposts of a better world. God reconciles us to God's self as the beginning of God's renewed humanity and world. This is good news. Our lives as they are, aren't our lives as they will be. Christ is our hope! There are no prerequisites to love. God loves us before we ever could love God. And that is what we are invited to image to the world around us. We refuse to let anything get in the way of relationship, insofar that it depends on us. If you are human, you belong at Pangea; you belong with us. Making peace is what God did through the cross and resurrection of Jesus. This peace extends to individuals, human communities, and all of creation. At the personal level, Jesus taught us that nonviolent resistance is part of the vocation of his followers. His vision of peace sparks revolutions of love. As followers of Jesus in a divided and violent world, we are committed to finding nonviolent alternatives and to learning how to make peace between individuals, within and among churches, in society, and between nations. If you want to know what it looks like to be fully human, look at Jesus. He, the "second Adam" as the Apostle Paul would say, is the prototype of what God intends humanity to be. So, the more we know and follow Jesus, the more we become Christlike, the more we become truly human: the image bearers we were always called to be. Jesus is not opposed to our humanness, but invites us to flourish into the fuller version of our God-given humanity. The Bible sometimes calls this "sanctification." The church in the twenty-first century is part of a narrative that goes back 2,000 years. As we read the Scriptures, we commit ourselves to doing what we can to interpret and apply the texts with first century contexts in mind. But the story moved forward from there. The church throughout the generations, with its ancient practices and postures, is our story. And yet the church is just one chapter in the story of God, one that started in creation and will reach its culmination in the renewal of creation. We co-create the future as we partner as actors in the Divine drama. The God who guides this compelling narrative is bigger than any categories or ideas with which we try to entrap the Spirit. We worship a God who leaves us in awe, and accepts us in our doubts. In what follows, we offer a few of our convictions about God, humanity, and the cosmos. At the end of the day, we strive to follow Jesus. The following ideas help root us in that journey. 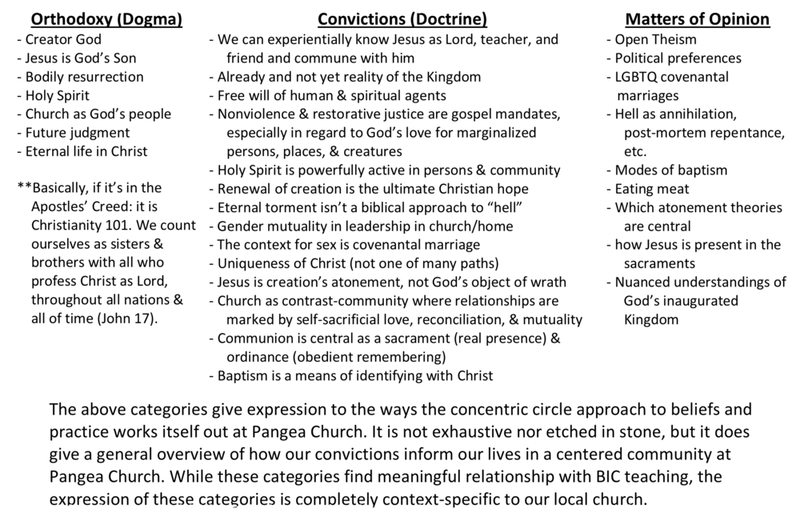 Pangea is a church affiliated with the Brethren in Christ Church in the U.S. As such, we share in the BIC's belief values, all of which give voice to some of our core theological convictions. Experiencing God's Love and Grace: We value the free gift of salvation in Christ Jesus and the transforming power of the Holy Spirit. Believing the Bible: We value the Bible as God's authoritative Word, study it together, and build our lives on its truth. As a worldwide community of faith and life we transcend boundaries of nationality, race, class, gender and language. We seek to live in the world without conforming to the powers of evil, witnessing to God's grace by serving others, caring for creation, and inviting all people to know Jesus Christ as Saviour and Lord. Although this is a document that isn't "official" in any sense, we'd say that it points to several theological tendencies at Pangea. So in no way are we officially affiliated with ReKnew or under its authority, but we think Greg Boyd and the community around ReKnew has penned some core theological ideas that inform the sorts of things we tend to emphasize or wrestle with at our church. You can read the whole statement here. The following Confession and Creeds reflect the historic Christian roots from which Pangea emerges. The Apostle's Creed, The Nicene Creed, and The Confession of Faith of the Brethren in Christ Church give a clear look at our spoken beliefs. The ancient Creeds have slight additions/alterations to fit our Anabaptist convictions. These changes are marked with an asterisk. Also, "I" language stated as "we" language in the Apostle's Creed. We believe that the Bible is the inspired Word of God as the final authority for faith and practice. and the life of the renewed* world to come. Amen. We believe in Jesus Christ, God's only Son, our Lord. ****Additions to Apostles' Creed and Nicene Creed were inspired by The Mennonite Worker, an intentional community in Minneapolis. Wherever we have added a sentence or key word, these are marked with an asterisk [*]. Although we are perfectly content to recite the common version of the Creeds, these slight additions serve to better express our theology, particularly our understanding of the life of Jesus. Many people have a picture of church that's been conditioned by certain forms of Christianity that give the impression that God is angry, vengeful, and judgmental. Central to our identity at Pangea is our vision of a God whose primary posture toward the universe is love. We seek to embody that vision by centering on 5 radical core values. We gather in two different modes: a Sunday Worship Gathering and in neighborhood-based groups called Villages. In some ways, Sundays are get-togethers for our Villages from around the city. New folks are invited to check out our Sunday morning worship experience and follow up by meeting a staff or leadership person for coffee to talk about Villages and other ways to connect! This all started out as a dream in the summer of 2010. Little did Kurt know that he--along with his wife Lauren, daughter Lydia, and pups--would be moving to Seattle (from CA) to start a brand new church in partnership with the Brethren in Christ. Part of what drove Kurt, and still drives him today, is that he believes that Jesus gets bad press in our culture. Some "brands" of Christianity tie the cross and the flag so closely together that it's hard to distinguish if Jesus started a countercultural movement or an American political platform. The Jesus of America is the Jesus of status quo power games. But the Jesus of the New Testament--who taught us to love our enemies, to welcome children, to serve the poor, to seek transformation, to include anyone willing--this is the Jesus that Pangea seeks to represent. A church that follows in the way of Jesus, to inspire others in the way of love. Everything we do is driven by our values. For more details, check out our Values & Convictions page. We are a church community with some partnerships. These affiliations remind us that we are not in this alone. We are part of a larger tribe - some of which is represented below. Added to this list are countless others who have encouraged us, prayed for us, or share our values. Brethren in Christ Church in the U.S. - Our family of churches. Urban Expression North America - Our church plant coaching network. Mennonite Central Committee - Our Anabaptist justice and peacemaking organization. The Global Immersion Project - Our peacemaking training partner both locally and in Israel/Palestine. Mennonite World Conference - Our broader Anabaptist family. St. Luke's Episcopal Church - Our local ministry partner (we meet on their church campus) and friends in kingdom work. "Pangea" is a word that offers two different images which are significant for our church. The tree represents both the cross and the tree of life. The Scriptures say that "leaves of the tree are for the healing of the nations" (Rev. 21), which is a vision of God's ultimate intention for this world. Each tile of stained glass represents a diverse community within our church, which extend God's love as though existing as a "leaf" of reconciliation. The glass, of course, also points to our ancient-future approach to worship. And finally, the pieces come together within a circle, representing Pangea as defined on this page. Pangea represents God's Kingdom - one that transcends borders and includes the invitation to form a new humanity. In Ancient Greek, Pangea means – “entire” “earth.” It was the “super-continent” that was formed prior to the tectonic plates eventually shifting to break apart the world into the seven continents we currently know. Where this becomes a theological concept is the idea that God’s kingdom is one that unites the world under God’s perfect reign. To this kingdom and to the King of Kings we give our full and primary allegiance, even as we sojourn in a land that is called America. Our identity as Christ-followers transcends the borders of any nation or anything else our culture creates to divide people. Christ unites unlikely people. Pangea also serves as an image of our gathering and scattering ethos. We are made up of multiple communities that are all part of the larger movement. In other words, Pangea are exactly that – several Villages (home groups) united by a common vision of what it means to live out our love for God and neighbor. All of these groups (about 12-24 people) come together as one through a shared set of vision and values. One thing people often wonder is: Will this faith community be a "fit" for me? There's only one way to find out—come hang with us on a Sunday or during the week! If you’ve been burned by the church, we might be a fit. If you long for authentic relationships guided by love, we might be a fit. If you seek mystery paired with lively music, we might be a fit. If you're a religious misfit, we might be a fit. If you've followed Jesus your whole life, we might be a fit. If you long for a faith rooted in formation and activism, we might be a fit. If status quo pat answers rub you the wrong way, we might be a fit. If you want to be part of a community where everyone's welcome, we might be a fit. If you’re ready to roll up your sleeves, get your hands dirty for our city, and connect with like-minded folks—we just might be a fit for you.